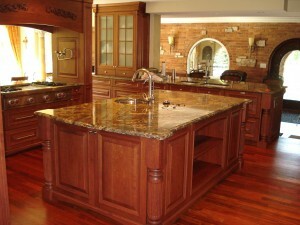 What Can I Use to Clean My Granite Countertops? Prepare your granite countertops for cleaning. First, clear any items, appliances and debris that are on the countertops. Set appliances and items aside so that they do not get in the way of cleaning or get damaged by the products that you will use to clena the countertops. If there are any spills or sticky residue on the granite countertops, wipe them down with a sponge and warm soapy water. The trick to ensuring that stains and spills don’t stick to your countertops is by wiping them immediately. If it is too late and the liquid has already set, grab a hot wet rag and work on loosening and removing the debris. Mix a homemade cleaning formula for your granite countertops. This answers the question of what products or solutions are safe to use on your granite countertops. The rule of thumb is not to use products that contain acid or acid-based chemicals. On the other hand, PH balanced cleaners are completely safe and ideal to use. It is also best to avoid using ammonia, lemon cleaners, and vinegar. Granite does not respond well to these substances despite its tough and hardy exterior. Use a clean white cloth for washing the counters. Be sure to choose one that has microfibers to avoid leaving behind any excess fibers that will leave their mark on the granite countertops. Be sure to clean your granite countertops every day to maintain it.